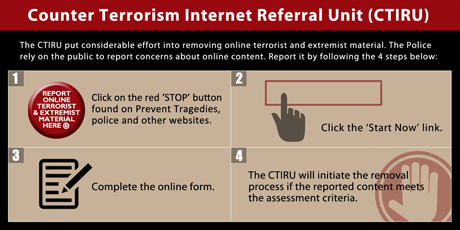 If You Suspect It - Report It: In the current climate, the threat of terrorism is real and ongoing. Across the country, people from all faiths and backgrounds are standing together to tackle terrorism. By making sure we each know how to recognise the signs and know what action to take, we can work together to prevent acts of terrorism. Terrorists live amongst us; they store their equipment and materials. They need vehicles. They have people who help them - and these people might come and go at strange times of the day and night. They might make unusual financial transactions or use false documents to hide their real identities. They might be behaving differently to how you've known them to behave in the past. The Police become aware of people or activity in a variety of ways, but often the most accurate and valuable information is that passed on by neighbours, work colleagues, friends and even family members of those involved. If you suspect it, report it. More information about the can be found on the Metropolitan Police Website. Disclaimer: Please note that by accessing external links you will be leave the West Yorkshire Police website. West Yorkshire Police is not responsible for the quality, accuracy or content of external websites. North East Counter Terrorism website click here. Worried someone you know could be being radicalised? If you have concerns about a loved one who may be becoming radicalised please contact local police on 101. Terrorist related material online can be reported anonymously to specialist officers via www.gov.uk/report-terrorism . Any suspicious activity can also be reported to the police in confidence on 0800 789 321. The national counter terrorism network reduces the risk of terrorism by delivering the Government’s CONTEST strategy. CONTEST was launched in 2003 in response to the growing threat from international terrorism. The strategy has evolved significantly overt the last eight years, in line with lessons learned, public and political scrutiny and the developing threat. It was reviewed and updated by the coalition Government when it came into power and remains the UK’s long term strategy for countering terrorism. CONTEST is divided into four principal strands: Prevent, Pursue, Protect and Prepare. Terrorism inquiries are extensive and have the potential to tie up large numbers of officers for prolonged periods of time. The Counter Terrorism Units recognise the long term impact of these investigations on local forces. They bring together the range and volume of staff needed to respond to incidents, without hindering efforts to tackle the other crimes which affect our communities. The North East Counter Terrorism Unit, together with the North East regional forces, is better trained and equipped than ever before to combat the threat of International and Domestic terrorism. As part of the ongoing national counter terrorism strategy, the unit has dedicated Counter Terrorism Security Advisors (CTSAs) who are co-ordinated, trained and tasked by the National Counter Terrorism Security Office (NaCTSO). The primary role of these advisors is to provide protective and counter terrorism security advice to support businesses. The advice available takes into account both conventional and non-conventional terrorist techniques and the aim is to reduce vulnerability to terrorist threats. The CTSAs work closely with other Counter Terrorism Units and Police Forces throughout the Country, Government departments and other agencies. The public can play a key role in supporting the Counter Terrorism Unit and the Police. By remaining vigilant, being security minded and having good security measures in place, you can protect your business against crime and make the work of terrorists more difficult. A small investment in security measures greatly enhances the feeling of security on behalf of everyone and helps protect those around you. For non-urgent crime prevention advice, businesses can contact their local Crime Reduction Officer, but if you feel that your company could benefit from counter terrorism security advice, you can contact your local CTSAs via email: [email protected] or write to the following address: Counter Terrorism Security Adviser, PO Box 9, Laburnum Road, Wakefield, WF1 3QP.